Born in Australia in 1952, Charles den Tex was five years old when his parents repatriated home to the Netherlands. As a young adult, den Tex studied and worked in Paris and England before embarking on a career as a communication and management consultant in the Netherlands. Since publishing his first book in 1995, Den Tex has been a prolific writer of crime fiction often against a background of fraud in trade and industry. Until recently all his works were written and published only in Dutch, limiting his appeal to an enthusiastic Dutch reading audience. The first of den Tex’s novels to become available in English translation from World Editions, Mr Miller was first published more than a decade ago. 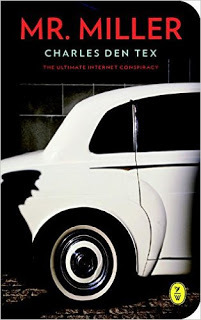 The cover identifies the book as ‘the ultimate internet conspiracy’, which in 2005 would have attracted more questions than in 2016 when Internet treachery seems commonplace in the crime world. Central character, Michael Bellicher is a communication consultant for HC&P, an Amsterdam based company with an impressive list of high profile European clients. Bellicher is young, smart, ambitious and reaping the rewards of sacrificing his personal life for the company. Both his best friend (Gijs) and love-interest (Jessica) are employees of HC&P. The story opens with Michael at Schiphol airport awaiting the arrival of his brother, Kurt, who he has not see for five and a half years. On seeing his brother, Michael collapses from an anxiety attack. He abandons his family for the solitude of his apartment, drinks heavily for three days, and then returns to his workplace to discover the fallout from his solecism. In a desperate move to save his career, Michael quickly secures an important client and hides in the company building after closing hours, allowing him to work on his new project through the night. His plan dissolves on discovering a dead woman outside the office canteen, and overhearing her murderers discussing what to do with the body. After the body is found in the company’s basement parking garage, Michael is identified as the only person registered as being inside the building on the night of the murder – making him the primary suspect in the case. Fearing for his freedom, Michael absconds and goes underground seeking information needed to prove his innocence. Things quickly become crazy when it becomes evident that not only does someone want Michael dead, they seem to know his every move. Following some serious attempts on his life, Michael unravels a small part of the mystery by connecting the website of Mr Miller to both the dead woman and his current peril. Who or what Mr Miller is becomes the foundation for this racing thriller. As a techno conspiracy theory thriller, Mr Miller is a tight tale. Having worked in the same world as Michael, den Tex provides a believable account of the world of a high-end communication consultant. By setting the thriller predominantly in Amsterdam, he provides local flavor to the tale and adds authenticity to the characters and their relationships. Credit too to Nancy Forest-Flier as the novel’s translator. This exciting read from Charles den Tex comes highly recommended.